I don’t know about you, but I love Pinterest. LOVE IT. But for a while there, I think I was just creating an internet-only beautiful life that I wasn’t fully living. Virtual life no longer! I’m cooking the recipes, crafting the crafts and using the inspiration boards for my own decor. Here’s what I tried out in my own home! The Pin: A geometric painted wood floor. This painted floor inspired me to try the same pattern in our dining room. It’s hard to tell in the photo, but I used a deep peacock blue, light gray and coral for my version. 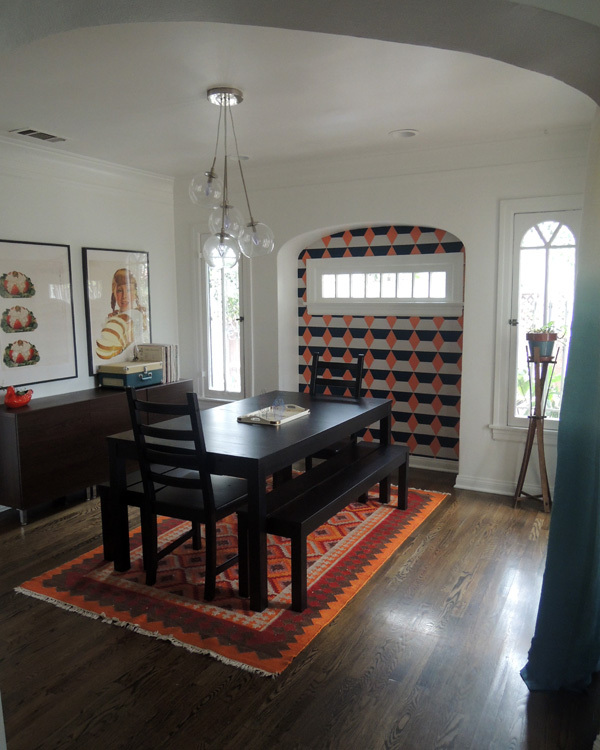 I love how it tied together our peacock ombre curtains, peacock record player and the orange and pink flat weave rug. The process was tedious to say the least, but totally worth it! I painted the whole wall gray first, and then taped off and painted the stripes. When that was completely dry, I taped off and painted the diamonds last. If we didn’t live in a rental, I probably would have used gold leaf instead of the coral, but I’ll save that for when we buy! What have you tried from Pinterest recently?